Coordinating the efforts of the Atlantic coastal states in the development and implementation of interstate fisheries management programs is the Commission’s primary role, with stock assessments forming the basis of these programs. The Commission assesses fish stocks to determine their status, to evaluate how they may be affected by potential management actions, and to forecast their future conditions. In fisheries, determining stock status means estimating one or more biological characteristics of the stock, such as abundance (numbers of fish) or biomass (weight), and comparing estimated values to reference values that define desirable conditions. The Commission conducts stock assessments on the majority of Commission-managed species in order to determine the health and status of the fish stock and to provide scientific advice to fisheries managers. The Commission also works closely with the National Marine Fisheries Service’s Science Centers and Regional Fishery Management Councils on the assessments for jointly or cooperatively managed species, such as Atlantic herring, summer flounder and Spanish mackerel. Generally, the Commission conducts two types of stock assessments (1) a benchmark stock assessment and (2) a stock assessment update. A benchmark stock assessment is a full analysis and review of the stock condition, focusing on the consideration of new data sources and newer or improved assessment models. This assessment is generally conducted every three to five years and undergoes a formal peer review by a panel of independent fisheries scientists who evaluate whether the data and methods used to produce the assessment are scientifically sound and appropriate for management use (peer-reviewed stock assessment). A stock assessment update incorporates data from the most recent years into the peer-reviewed assessment model to determine current stock status (abundance and overfishing level). In order to ensure the quality and credibility of its stock assessments for management use, the Commission oversees a formal peer review process to evaluate the accuracy of all benchmark assessments. The Commission’s stock assessment peer review process includes regional programs coordinated by the National Marine Fisheries Service - the Northeast Stock Assessment Workshop/Stock Assessment Review Committee (SAW/SARC) and the SouthEast Data and Assessment Review (SEDAR). The Commission also periodically conducts independent external peer reviews following a similar process. State and federal scientists attend an ASMFC Stock Assessment Training Workshop. Photo ©ASMFC. The Commission conducts workshops and distributes educational materials to provide hands-on training to state fishery biologists in quantitative population dynamics and stock assessment models. 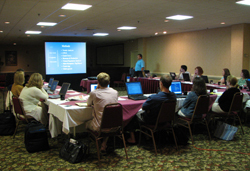 High level workshops have also been conducted for those state and federal stock assessment scientists in order to facilitate an exchange of information and provide advanced training in uncertainty principles and state-of-the-art modeling techniques. For managers and stakeholders, a Guide to Fisheries Science and Stock Assessments provides an introduction to the concepts and methods that form the basis of stock assessments. Layman educational seminars are also periodically conducted to increase understanding of stock assessment methods and applications. 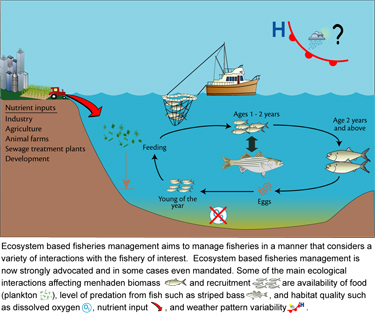 The current process of fisheries management typically involves decision-making on a species-by-species basis with little consideration of interactions between species, environmental effects, and habitat influences. Over the past decade there has been increased interest in including these additional factors in stock assessments to improve management of species that interact closely. For instance, Atlantic menhaden provides a food source for many important commercial and recreational fish, including striped bass, weakfish, and bluefish. All of these fish species are managed by the Commission, but decisions have traditionally been based on data collected and analyzed separately for each species. The Commission’s Multispecies Technical Committee (MSTC) informs and advises managers and scientists about important species interactions that may affect stock assessments and fisheries management. The MSTC has adopted a multispecies Virtual Population Analysis (MSVPA) model to explore important predator-prey interactions among key ASMFC-managed species. The MSVPA produces annual estimates of natural mortality rates at age caused by predation for Atlantic menhaden. These estimates are incorporated into the Atlantic menhaden single-species model. A multispecies statistical catch-at-age model is also in the early stages of development. The Atlantic Menhaden Technical Committee and the Ecological Reference Points Work Group are also in the process of developing ecosystem-based reference points for menhaden that account for predation to provide guidance to managers on how much menhaden biomass is required to meet the forage needs of their primary predators.